This support article illustrates how to manage the display for the chat app. 1. Click on the "Chat" tab and then click on the "Increase Font Size" option. Repeat until the desired font size is reached. 1. Click on the "Chat" tab and then click on the "Decrease Font Size" option. Repeat until the desired font size is reached. 1. Click on the "Minimize Width" button (fast rewind symbol). This will shrink the chat group panel to 10px, so that only the first letter of each chat group name will be displayed. 1. While the chat group panel is minimized, click on the "Restore to Previous Width" button (fast forward symbol). 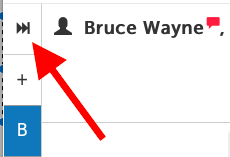 This will restore the panel to its previous width setting, and the group name will be displayed. 1. 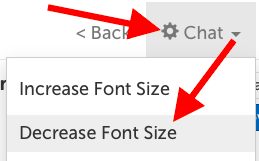 Click on the "Increase Width" button (forward arrow symbol). This will incrementally increase the width of the chat group panel. Repeat until the desired width is reached. 1. Click on the "Reduce Width" button (forward arrow symbol). This will incrementally decrease the width of the chat group panel. Repeat until the desired width is reached.